Here's yet another good news for Ajith fans. 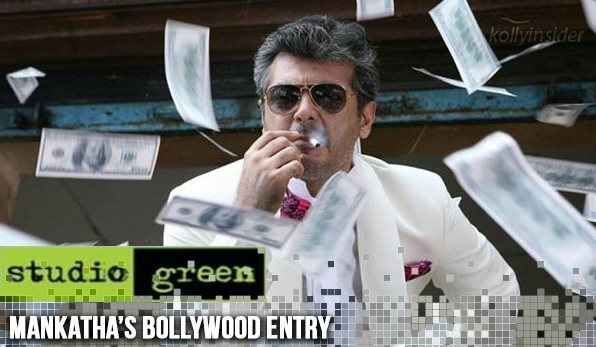 Thala Ajith's super hit film, Mankatha, directed by Venkat Prabhu, is all set to be remade in Bollywood. The official confirmation has been heard from the production house – Studio Green. Yes, the production studio has acquired the Hindi remake rights of Ajith Kumar’s blockbuster flick ‘Mankatha’, directed by Venkat Prabhu and produced by Dayanidhi Azhagiri of Cloud Nine Movies. This would be Studio Green's first venture in Bollywood. ‘Mankatha’ happens to be the 50th film of Ajith Kumar and turned to be an incredulous blockbuster hit with lots of surprising elements in the screenplay and ensemble star-cast of Action King Arjun, Trisha, Anjali, Vaibhav, Premgi Amaran, Ashwin, Mahat, etc. The film was later dubbed in Telugu as ‘Gambler’ and swept the Tollywood film buffs off the feet with raving reviews. The official announcement on the cast and technical crew will be made shortly. Currently, Studio Green is very busy with number of projects in Kollywood they include Suriya’s ‘Masss’, Mani Ratnam’s OK Kanmani, Karthi’s ‘Komban’ and Sivakarthikeyan starrer ‘Rajini Murugan’.